According to England's EVO Magazine, there's a lighter, track-ready version of the Toyota FT-86 planned that will drop the price from around $27,000 to $22,000 while adding stiffer suspension and stronger brakes. We'll take two. 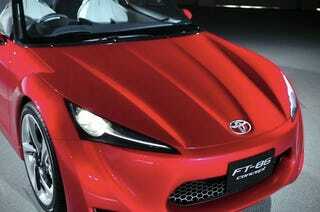 The Toyota FT-86 concept is the fruit of cooperation between Toyota Motor Company and Subaru, and as such will wear a common chassis and some degree of engine commonality. The shared 2.0 liter, four-cylinder boxer engine, dubbed the "C-45 Boxer" and making between 200 and 250 HP, will power the rear wheels through a manual six speed transmission, and get this — no hybrid system. Perhaps most telling are the car's overall dimensions. At 163.7 inches long, 69.3 inches, a wheelbase of 101.2 inches, and 49.6 inches high, it's thankfully compact, smaller in length, width and height than the Nissan 370Z, and slightly longer in wheelbase.